An amazing look at 1974 - the year when the Westerns were given a much-needed reprieve. Teenage Lament '74 centres on a year when the Class 52s still rubbed shoulders with the Hymek survivors. A4 hardback, 96 glossy pages, colour pictures throughout plus loco diaries. Perfect for the modeller, researcher or enthusiast. Part of the Western Series 1973-77 - why not collect all? I WISH TO ORDER TEENAGE LAMENT '74 BY ADRIAN CURTIS.I ALSO CHOOSE THE BOOK WRAP PACKAGING WHICH TAKES THE TOTAL TO £32.99. BOOK COST £27.99 PLUS £5 BOOK WRAP PACKAGING TOTALLING £32.99. An amazing look at 1975 - the year when the Westerns still ruled the rails on the Western Region of BR. Indian Summer '75 captures the atmosphere superbly during a year when Western haulage was virtually certain. And yes the sun shone again, punk rock was still a year away and the Bay City Rollers were hit makers. A4 hardback, 96 glossy pages and colour pictures throughout, plus loco diaries. Perfect for modeller, researcher or enthusiast. Part of the Western Series 1973-77 - why not collect them all? I WISH TO BUY INDIAN SUMMER '75 BY ADRIAN CURTIS. I HAVE CHOSEN THE EXTRA BOOK PACKAGING OPTION AT £32.99 INCLUDING POSTAGE AND PACKING. An amazing look at 1976 - the year of the record breaking heatwave and the final summer of the Westerns. Spirit of '76 captures the mood in reflective style. A month-by-month breakdown takes the reader through a climactic year for the class. A4 hardback, 96 glossy pages, colour and b/w pictures throughout. Perfect for the modeller, researcher and enthusiast. Part of the Western Series 1973-77 - why not collect them all? I WISH TO ORDER SPIRIT OF '76 BY ADRIAN CURTIS. I ALSO CHOOSE THE BOOK WRAP PACKAGING WHICH TAKES THE TOTAL TO £32.99. BOOK COST £27.99 PLUS £5 BOOK WRAP PACKAGING TOTALLING £32.99. An amazing look at the last two months of the Westerns in 1977 brings the Western Series to a close in style. Final Salute is the perfect send-off for the fleet. It was our first all-colour book and provides a fitting end for a fine series. A4 hardback, 96 glossy colour pages and an A4 size shot of each locomotive in the class is included. Perfect for the modeller, collector or enthusiast. The final part of the acclaimed Western Series 1973-77. I WISH TO ORDER FINAL SALUTE '77 BY ADRIAN CURTIS. I CHOOSE THE BOOK WRAP PACKAGING WHICH TAKES THE TOTAL TO £32.99. BOOK COST £27.99 PLUS £5 BOOK WRAP PACKAGING TOTALLING £32.99. More than 100 pages of pure knowledge for the historian, modeller and enthusiast. Western Volume One includes all works dates, all liveries carried in pictures, both colour and b/w. fujll fact files on all engines, including last workings and information on names and aborted lists. Information on who designed them, now critically acclaimed as the most comprehensive book on the Swindon-built locomotives. A4 hardback, glossy paper throughout - a must for any self-respecting Western enthusiast. I WISH TO BUY WESTERNS VOL. 1 - Swindon-built locos D1000-29 BY ADRIAN CURTIS. I ALSO CHOOSE THE BOOK WRAP PACKAGING WHICH TAKES THE TOTAL TO £32.99. More than 100 pages of pure knowledge for the historian, modeller and enthusiast. 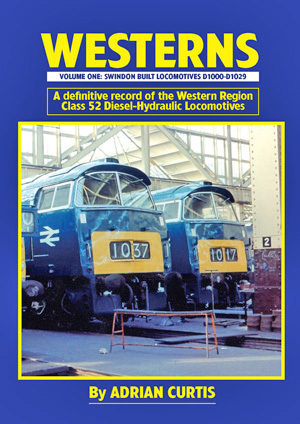 Western Volume Two includes all works dates, all liveries carried in pictures, both colour and b/w, full fact files on all engines, including last workings and information on names and aborted lists. Information on who designed them, now critically acclaimed as the most comprehensive book on the Crewe-built locomotives. A4 hardback, glossy paper throughout - a must for any self-respecting Western enthusiast. I WISH TO ORDER WESTERNS VOL. 2 CREWE-BUILT LOCOS D1030-73 BY ADRIAN CURTIS. I CHOOSE THE BOOK WRAP PACKAGING WHICH TAKES THE TOTAL TO £32.99. Now critically acclaimed as the Class 22 bible, this book, the first of its kind for the fleet, features detailed information for the modeller, researcher and historian. A fabulous effort from author David Wilson who rightly takes the plaudits for an informative and groundbreaking publication. Full of colour and black and white pictures of this little-known fleet. A4 in size, hardback and 96 pages. Simply stunning. Unavailable for a time due to being out of print, I am now pleased to provide a quick 28-day turnaround for this and all the books in the catalogue. Order now with confidence. 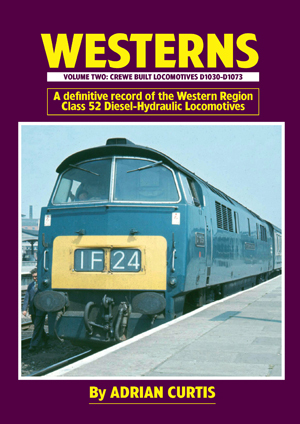 BUY YOUR COPY OF THE ACCLAIMED CLASS 22 BOOK BY DAVID WILSON HERE, BOOKS FROM THIS CATALOGUE ARE PRINTED TO ORDER AND TAKE NO MORE THAN 28 DAYS TO DELIVER DIRECT TO YOU. PRICE IS £32.99 IN SPECIAL BOOK WRAP PACKAGING. POST FREE. MORE THAN 100 PAGES, COLOUR AND B/W TRACKS OF MY YEARS IS A MUST FOR MAYBACH FANS! 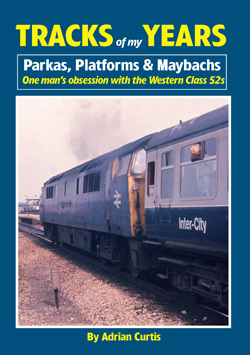 Tracks of My Years, by Adrian Curtis, is a powerfully evocative book about the author's love of railways and the Western Class 52 Diesel-Hydraulics. In this superb A4, hardback publication, which includes many unpublished photographs, Adrian takes the reader on a journey beginning in 1961 with the birth of the Westerns - just three years after his own arrival in the world. It is a book to touch the hearts of everyone with Maybachs, music and the 60s and 70s in their blood. You can almost taste the emotion as the author recounts the way his passion for the Western class finally took hold in the early 1970s. It's a Western book, you won't want to put down. "I picked up my copy of TOMY yesterday from the post office (been away on holiday), I have to say that this is by far the best book featuring the westerns that I have in my collection." Bob, Yorkshire. "I have started to read Tracks of my Years and can inform you that I wanted to continue onto each new year and read it in one go, I truly could not put it down," Phil, Kettering. PLEASE SEND ME A COPY OF TRACKS OF MY YEARS BY ADRIAN CURTIS AT £32.99 INCLUDING POSTAGE AND PACKING. I UNDERSTAND THIS WILL HAVE EXTRA BOOK PROTECTION CARD PACKAGING.